See Sharp Press, 9781937276768, 160pp. 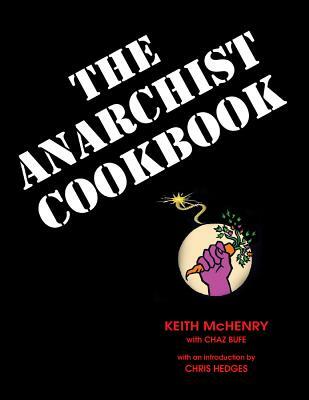 Unlike the original Anarchist Cookbook, which contained instructions for the manufacture of explosives, this version is both a cookbook in the literal sense and also a “cookbook” of recipes for social and political change. The coffee-table–sized book is divided into three sections: a theoretical section explaining what anarchism is and what it isn’t; information on organizational principles and tactics for social and political change; and finally, numerous tasty vegan recipes from one of the cofounders of the international Food Not Bombs movement. Keith McHenry is a cofounder of the international Food Not Bombs movement. He is the author of Hungry for Peace and the coauthor of the Food Not Bombs manual, Food Not Bombs. He lives in Taos, New Mexico. Chaz Bufe is the author or coauthor of multiple books including Alcoholics Anonymous: Cult or Cure?, The Devil’s Dictionaries, The Heretic’s Handbook of Quotations, Provocations, and An Understandable Guide to Music Theory. His writings have appeared in dozens of newspapers, magazines, and websites, including Belief.net, Communities, Counterpoise, Eye,Freedom, the Match!, New Times Weekly, Processed World, and the Utne Reader. He lives in Tucson, Arizona. Chris Hedges is a former New York Times reporter and a leading progressive writer and activist. He has 12 books in print, including New York Times bestseller Days of Destruction, Days of Revolt, and Wages of Rebellion. His work also regularly appears online. He's a columnist for Truthdig, and has written for Alternet and Common Dreams.